1. Know how much you are willing to pay. This depends on how flexible you're willing to be! If you are looking for something really specific, be ready to pay more, since there might only be a few patterns produced within your parameters, and so vintage copies will be rare. For example, if you are looking for a full-skirted 60s-era dress with short raglan sleeves, there will be many fewer options than if you are just looking for a short sleeved full skirted dress of any description. If you are looking for a woven wrap dress with long sleeves and ruffles on the neckline and a bow sash, you've really narrowed down your options! Vogue patterns typically go for more than McCalls, Butterick, and Simplicity patterns, and designer patterns can go for three digits, but I usually pay about $8-$15 for a vintage pattern--about the same as an indie designer. I think a good rule of thumb is if you would feel comfortable paying a certain amount for a particular indie design, you can feel confident paying that amount for a vintage pattern. Here are the prices I paid for my last few vintage pattern purchases, for context: $12, $8, $8, $22, $10, $11, $9, $15. The $15 pattern was my raglan sleeved dress, Simplicity 4475 (which I've made 3 times already, so totally worth it) and the $22 pattern was my interesting faux-wrap dress, Simplicity 1123, which is so unique I had to have it, and haven't seen any other similar patterns. The most I've ever paid for a pattern was about $30 for a 60s Vogue bikini pattern with the most gorgeous pattern illustration ever. There's currently a copy on etsy for $8 though--bringing me to my last point: if you don't need a pattern right away, you can always wait and see if another seller will list it for less, the danger being that that there won't be one cheaper--in fact, there may not be another copy at all! 2. Know what to pay for, and what to skip. This is where the back of the envelope is important! Many vintage patterns have line drawings of the pattern pieces they contain on the back with the rest of the sizing information, etc., and these drawings can contain very useful hints at construction. I've been drawn in many times by gorgeous skirts on the front of the envelope, only to check out the pattern piece diagrams and realize they are just pleated or gathered rectangles, illustrated in a beautiful (and potentially sliiightly misleading) way. At this point, I have a pretty decent collection of basic bodices (wrap bodice, raglan sleeves, long sleeves, v-neck, etc.) and I know I can add a pleated or gathered skirt on to any of those styles easily, so shouldn't pay for a beautifully illustrated skirt. I generally look for interesting details. Be willing to pay for unique details (like the faux-wrap bodice of Simplicity 1123) but don't get suckered into paying a lot for a prettily drawn but basic pattern--that is, unless you want it for the artwork! 3. Know your size, and search by the right numbers. Most vintage patterns from the 50s and 60s are single-sized--that is, the envelope contains all the pattern pieces for once size. This is unlike modern commercial patterns, which are almost all multi-sized, with sizes layered for easy grading between sizes. While there are positive aspects to this (see #4 below), it does make finding your size a bit trickier, since you don't have the wiggle room afforded by a multi-sized, nested pattern. I think that finding your correct size will always involve a little bit of trial and error--as with any aspect of sewing--but if you have an average-sized bust, it's likely safe to start there. (Personally, I find that I fit very nicely in 60s pattern with a bust measurement of 32, even though my actual bust measurement is more like 33-34.) My main advice here, though, is to search by bust size: most single-sized patterns will be listed on etsy under both "size" and bust measurement since both are listed on the front of the envelope. Pattern sizing changes over time and varies between companies, so if you search "60s cocktail dress pattern 12" you might get patterns that are for bust sizes 30, 32, and 34! If you search "60s cocktail dress pattern 32" you will get all the patterns that are your size, and none that are not! 5. Know how to grade if necessary. Sometimes, despite your best efforts, you just can't find that perfect pattern in your size. If you really love a vintage pattern that isn't available in the size you need, you might want to consider grading the pattern: slashing and spreading (or overlapping) the pattern pieces to size up (or down) the pattern. You can generally grade a pattern up or down two sizes--so if you have a 40" bust, I wouldn't recommend purchasing a 30" bust pattern, but that 38" bust pattern is now in the realm of possibility for you! Sense and Sensibility Patterns have a detailed guide on grading pattern on their blog here, or there's a quick and dirty version here. Everyone has their own ways of doing things (I, for instance, almost always cut right into my PDF patterns, and others always trace them) but I hope this little guide gives you the confidence to go out a find the vintage pattern of your dreams!! After that comes the fun part--sewing! If you're convinced, sign up for Vintage Pledge 2017, while you're at it! In the past, I've pledge to sew specific patterns or a certain number of patterns, but last year I just pledged to sew a bunch of vintage that I would love, and I'll be doing the same this year. I already have three vintage garments sewn up (my silk and lace swing dress, my seersucker nightgown, and my floral spring dress) and I plan on making many more! What about you? 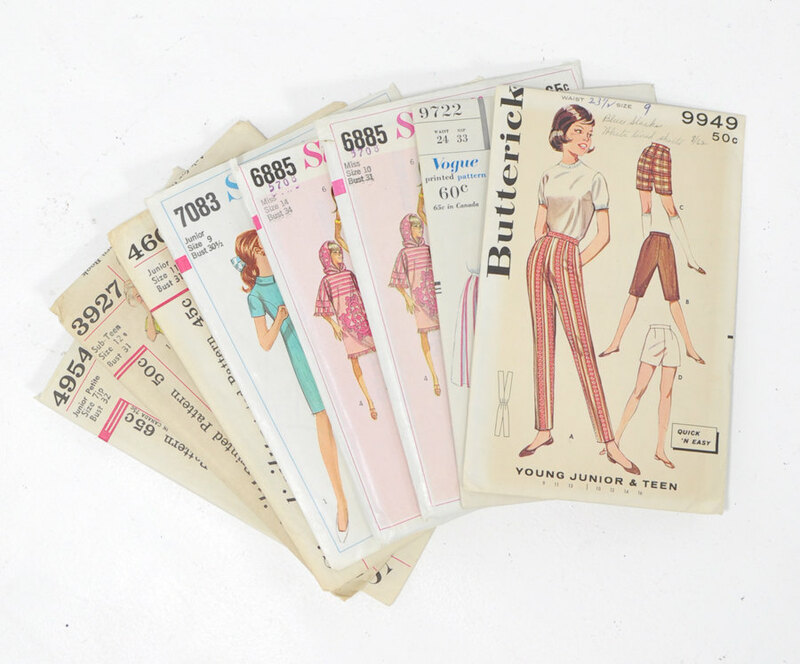 Are you planning on building your vintage stash... or sewing some vintage patterns already in it? This amuses me - as I sewed all those 60's patterns when I was a teenager. Oh, I wish I had the patterns I threw away when I cleaned out my old stuff in my mom's house! There are a few I'd like to sew now. You wear "vintage" (AKA my youth) very well! I enjoy your photoshoots as a fellow Durham/Chapel Hill-ite. I've had my eye on Advance 7831 - I am obsessed with scalloped necklines! I have only ever bought one vintage pattern so this article is fantastic! I'm glad it was helpful! Those scallops are super cute! I poked around and thought Simplicity 6340 was pretty cute! Love those princess seams. Simplicity 6667 also has very interesting lines. I'm pregnant right now and there are some really cute maternity dress patterns from the 70's that would be great to wear this summer! Simplicity 4228 looks intriguing to me. Great tips! I've been burned before by the beautiful line drawings...definitely once bought a vintage wrap skirt pattern that was little more than a gathered rectangle of fabric. I've been eyeing wrap blouses from the 1970s, including Butterick 6898. Thanks for the givewaway! After looking around on Etsy, I found a listing for a "1940 WW2 Vintage Sewing Pattern B38 DRESS (1483) Du Barry 2476B". I think I'm in love, lol! I looked at the size and measurements, they almost matched mine exactly! I kinda love this one:) I sew a lot but haven't tried too many vintage things. Now, I really want to! My stash is large and varied enough that I really shouldn't add any more to it, but I do because I cannot help but LOVE vintage patterns. However, I am making sure to fill it up slowly at this point with patterns that I wait for, admire the special features, and maybe pay little extra for because they're a well thought out purchase by the time they are bought. I mostly sew vintage so my pattern stash does get used. My latest pattern that I've been waiting (for a year now) to find cheaper is McCall's #4470, year 1958...I even have a fabric picked out for it in my stash, just waiting for when I *finally* but the pattern...there's always one on Etsy but I only allow very few $30 to come to me! I know it isn't a gorgeous dress or anything, but I'm intrigued by Stretch & Sew 1005, Ann's Hooded Jacket. I think it would be a good casual sweatshirt for the beach and it might be a good way to dip my toe into vintage. Thanks for the chance to win! I would pick the Simplicity 5971 pattern. I love the McCall's 2630. Something about the high waist with the V. I would do a sleeveless short version. Now to find it in my size or I could go with your suggestions to just make it just a little bigger. I bought some vintage burda patterns in the past (from the sixties) but I haven't used them yet - I really should, their design is very unique! I also have a stack of sewing and knitting (mostly knitting) magazines from my Grandmother, from the early fifties, but most come without patterns, but they are incredibly inspiring! Also thanks for tip#2 - never be fooled by just pretty illustrations! Hi @AllieJ I have seen so many of your makes before. But I just started following you on IG and your destash page because, well, I am an addict. A pattern and fabric addict. I took the basic sewing classes in JR high school & I think 1 in HS (then called home economics) then I sewed spoardically when I had my babies. Sew over the last 25 years I really didn't work to improve my technique/skill, sadly a mistake on my part. In the last 2 years since my youngest graduated from HS I had so much time on my hands and I have commandeered the dining table, then a space in the family room and now my oldest son's bedroom! Oh how I love the space and each time I add a piece of furniture I feel more and more like a real sewists! I have done the Pledge the last 2 years and have already submitted a few pieces of eye candy and one make just needing to be hemmed. I really liked reading your piece. Especially about what you are willing to pay. I know when I see a pattern for $75 that it is totally worth it but would I make it? Spending that much would make me guilty if I didn't. So I don't. The patterns for $10 & under is my comfort zone. The most I have paid so far is $25+shipping for #Vogue4882 to wear for my 50s theme 50th birthday (which also became a 26th anniversary vow renewal) I had to have it! My heart skipped a beat a when I saw it (@thanksimadethis was bragging about a a recent haul) and I had the perfect fabric my husband bought for $3 per yard when he was in NY on business. I knew the 12 was going to be a little small and I didn't know the proper grading process but God wanted me to have this dress because I think it is perfect. I love the clothes from the 50/60s and some 70s and they will become part of my regular days wear soon since I am buying more patterns (143 vintage and reproduction patterns not counting some of the kids patterns I bought by mistake) and making more. You ladies and gents new to sewing or new to sewing vintage please listen to Allie, know what you are paying for but if you don't want to draw pattern pieces, like me. Those rectangle pieces may be just what you need. Lastly condition. If you are buying from Etsy, Craiglist, Facebook whatever - pay attention to the size of the pattern especially. Make sure it is your size and complete. If it is not complete FB has a group that may be able to help you find missing pieces. I would also caution that if you are buying a large lot that you make sure you are getting what you meant to buy. I have bought patterns lots that included craft items(don't want) or baby & teen patterns (don't need). So, Sewists. Good luck with your purchases and your makes. Help is on YouTube and FB. Hope to see some of them in the pledge. Allie, hope I win the Etsy gift card. I just found your blog and I'm so glad I did! Very inspiring and fun content! I sew with vintage patterns a lot and really appreciate your tips. Thanks for the giveaway! I would buy a fifties play suit pattern if I won! How fun would that be for the summer?! After several years of 50s and early 60s styles, I've completely fallen in love with 40s dresses. I just spotted a McCall 4530 in my size on Etsy that I would love to get my hands on! I really enjoy vintage patterns but it is amazing how the sizing has changed over the years! I'm currently obsessed with 70s styles and would like to sew Simplicity 7393 - the pants, or McCalls 4102. Thanks for doing such a fun giveaway! The very first pattern I bought was a vintage sundress from the 1970s, on EBay...at which point it went into a drawer for the next 6 years. This might be the summer I actually sew the thing! Gorgeous! I think you have the perfect blend of vintage and modern style! The Vintage sundress looks so cute! I love the 1950s poodle skirt patterns. Also, the vintage apron patterns. My grandmother always wore a vintage handmade apron when she cooked...every day. I would love to get a vintage fifties dress pattern, I'm still learning how to sew. Simplicity 4228 captures my attention.